Enter your email to get my FREE Starter Library and also be added to my VIP Reader Club. I can’t stand it either! And I won't share your information. Your subscription to my list has been confirmed. Thank you so much for subscribing to my newsletter, The Regency RoseTM! You'll receive a monthly publication with all the latest information about my books, a giveaway opportunity, my events and appearances, a chance to ask me questions, and miscellaneous fun facts. Occasionally (once or twice a year) I send out an email with a special announcement too. 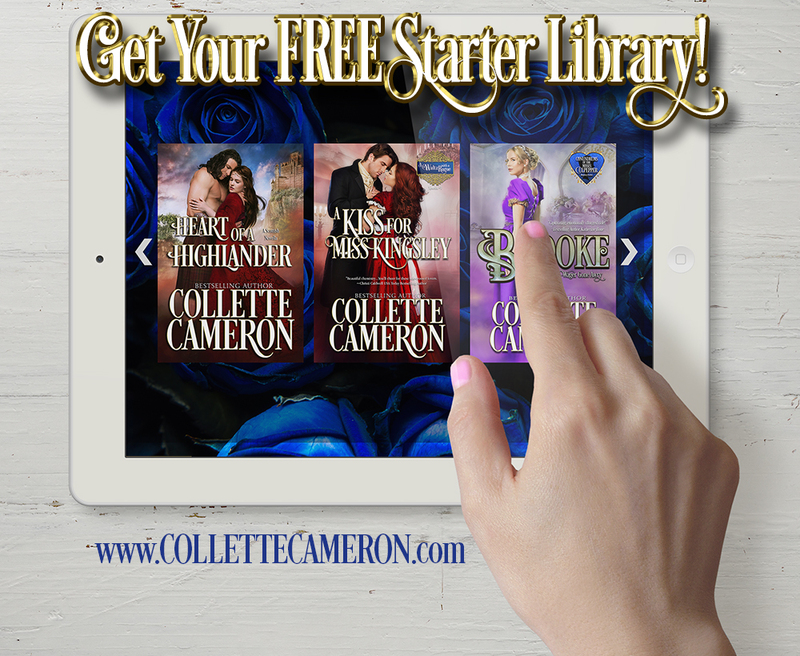 Free digital downloads of Collette Cameron's Starter Library! Download HEART OF A HIGHLANDER here! Download A KISS FOR MISS KINGSLEY here! Download BROOKE: WAGERS GONE AWRY here!